Yoghurt contains a kind of good bacteria, called lactobacillus that helps build our digestive system healthy. When we catch a flu and need to take any antibiotics, we'd feel our appetite decreases too. Why? The antibiotics help us to kill the bad guys (harmful bacteria) in our digestive system, unfortunately at the same time they kill the good guys (good bacteria) too. The lactobacillus is the good guy we need then. Yoghurt is rich in protein, calcium, and other vitamins. 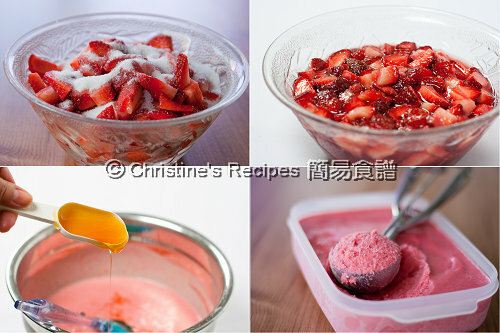 The fruit I like the most to add into yoghurt is strawberry. Although summer hasn’t come yet, I love to take as much as yoghurt ice cream as I love. It’s a really good dessert after dinner throughout the year. If anyone asks me where to get great ice cream recipes and ideas, I won’t hesitate to recommend David Lebovitz’s blog to him/her. David Lebovitz has generously shared heaps of useful information about how to make delicious home-made ice cream. One of his popular cook books, The Perfect Scoop: Ice Creams, Sorbets, Granitas, and Sweet Accompaniments is surely a keeper too. 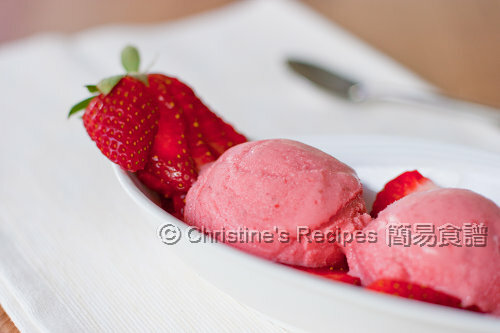 Slice the strawberries and toss them with the sugar, and let them macerate for one hour at room temperature. Puree the berries and their liquid with a standard or immersion blender. You can puree it until completely smooth and strain out some or all of the seeds by pressing the mixture through a mesh sieve. Or you can leave it slightly chunky and omit straining it. After draining the berries, stir in the yoghurt and honey and combine well. Adjust the amount of honey to your personal liking. Taste, and add lemon juice if desired. 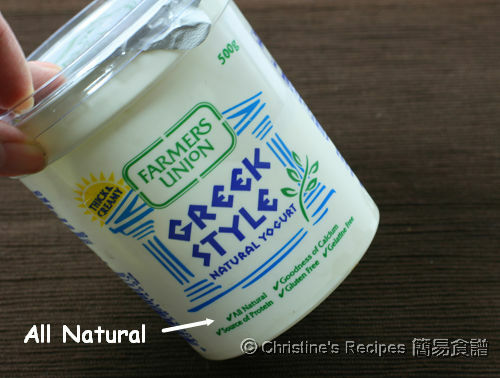 Greek yoghurt, compared to other kinds of yoghurt, is thicker, smoother and creamier. The end result of using Greek yoghurt was very satisfied. I highly recommend it when it comes to making yoghurt ice cream. Christine, this looks so delicious, I hope I can have some now. I especially like the color, so bright and pretty. I was thinking of a similar recipe, but inspired from Neil Perry. I love yoghurt, so this fits with me nicely. So refreshing! The ice cream recipe looks relatively healthy. I never saw a yogurt ice cream before, or does this count as frozen yogurt? Pink, my favorite color! The ice cream looks very pretty, such a nice tone of color. Thanks for sharing it. I checked out some of your other recipes, and have already found a few that I would like to try. Btw, were you originally from Hong Kong? Hi Jess & Anh, thanks so much. I really want to try this. Looks so refreshing and yummy! Looks so strawberry and yummy! When you say freeze in the ice-cream maker - what does it do? Is there any functions that the ice-cream maker is performing e.g churning the mixture or....??? I want to make this but do not have an ice-cream maker. Mmmm...like this. The colour is so beautiful. 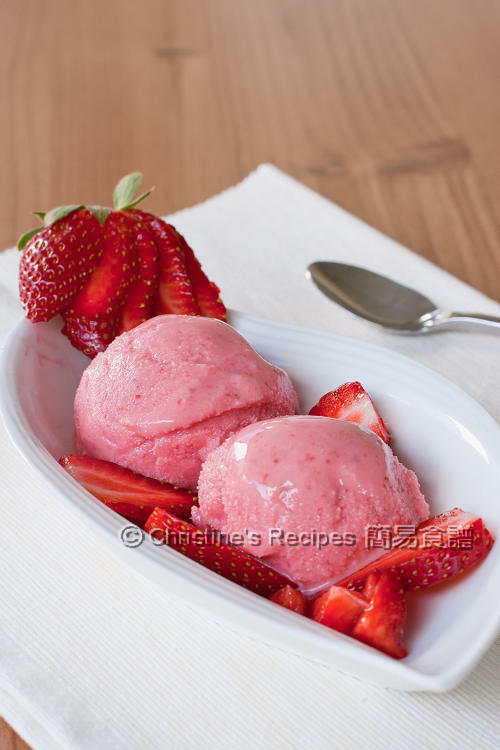 I wish I have an ice-cream maker! This looks so delicious! Autumn is coming and it's getting rather cool here, but I still wouldn't refuse a bowl of ice cream as beautiful as yours! I buy the same brand of Greek Yoghurt. This is by far the best in terms of texture and taste. Love this healthy ice cream. Lucky that you have strawberries up there now... we have to wait a couple more months.... YUm YUM! How can something look this good be good for you too?!? Yay! Mmm this looks absolutely delicious. I love Greek yogurt too. Lovely yoghurt! I agree it's a great dessert year-round..